A few months ago I wrote a couple of articles on my Masters research project; here and here. Well I thought I better report back on some of my findings. The report entitled ‘Participatory GIS acquisition of pastoralist’s local knowledge: Dynamics of overgrazing at Wadi Sayq, Dhofar Governorate, Oman’ used multidisciplinary methods to address the nuts and bolts of overgrazing at Wadi Sayq in the Dhofar Mountains. 1) Map the spatial and temporal arrangement and identify the ecological impacts of grazing regimes. 2) Identify the problems currently faced by pastoralists and the barriers to more sustainable grazing practises. 3) Explore the extent of the issue of livestock depredation. 4) Investigate the coincidence of grazing activity with pasture suitability and predator distributions. 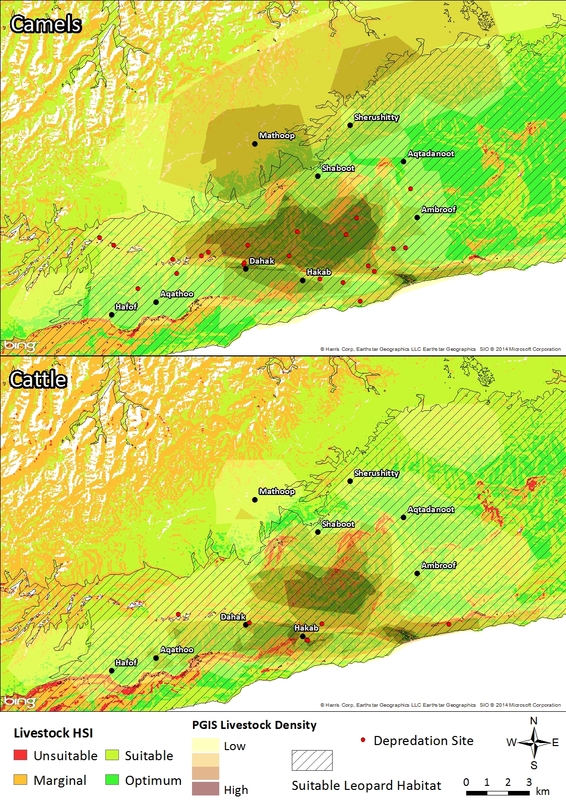 Below is one of the figures which displays suitable leopard habitat, livestock depredation sites, suitable grazing habitat and actual grazing activity. Despite the tension between livestock owners and predatory mammals most informants agreed that the current degradation of grazing resources at Wadi Sayq was a greater threat to their pastoral livelihoods. Hence we see in the above figure, abundant grazing activity in the wadi catchment at the heart of the leopard habitat out of necessity for livestock owners to find optimum pastures for their livestock, albeit at the risk of depredation. Severely overgrazed areas at Wadi Sayq are the deforested plateau grasslands. The main areas targeted for grazing are shallow gradient, medium-density woodlands that provide browse for camels, and grasses for cattle through horizontal precipitation capture. They are in the process of degradation as naturally they would be more densely vegetated and unpalatable species would be less abundant. This research demonstrated the effectiveness of citizen science and low-budget research in the area and the willingness of local livestock owners to participate and engage with community-based research. Also noteworthy, was their understanding of the fundamental drivers of overgrazing and realisation of the urgency for improvement; illustrated by their individual efforts to protect and plant new trees. This research, accompanied by the rapid biodiversity surveys conducted in 2012 and 2013 on the British Exploring expeditions, make Wadi Sayq one of the most studied wadi systems in Dhofar and well-suited to be utilised as a model ecosystem for testing, much needed, improved policy and management.